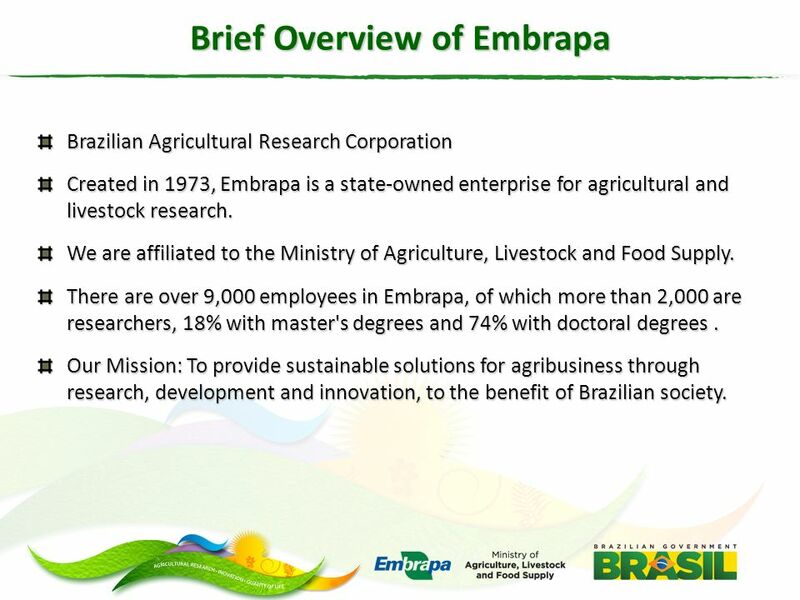 2 Brief Overview of Embrapa Brazilian Agricultural Research Corporation Created in 1973, Embrapa is a state-owned enterprise for agricultural and livestock research. We are affiliated to the Ministry of Agriculture, Livestock and Food Supply. 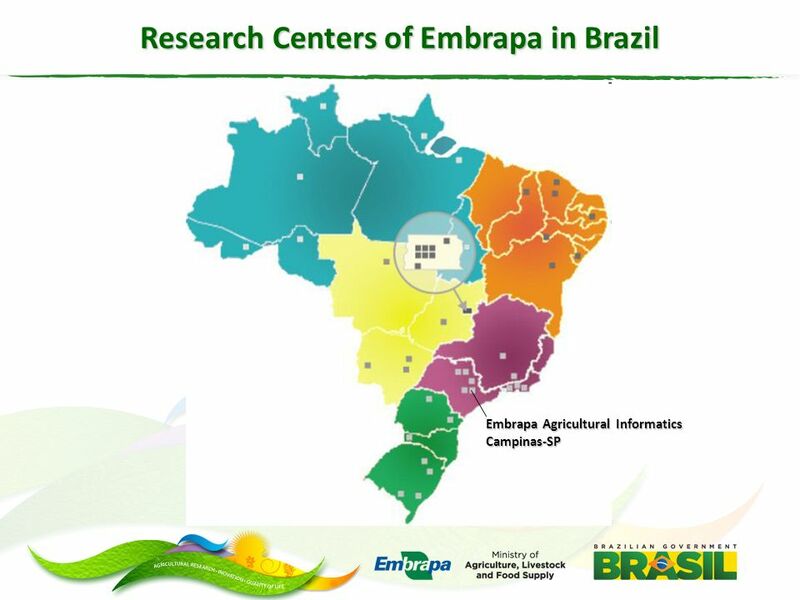 There are over 9,000 employees in Embrapa, of which more than 2,000 are researchers, 18% with master's degrees and 74% with doctoral degrees. 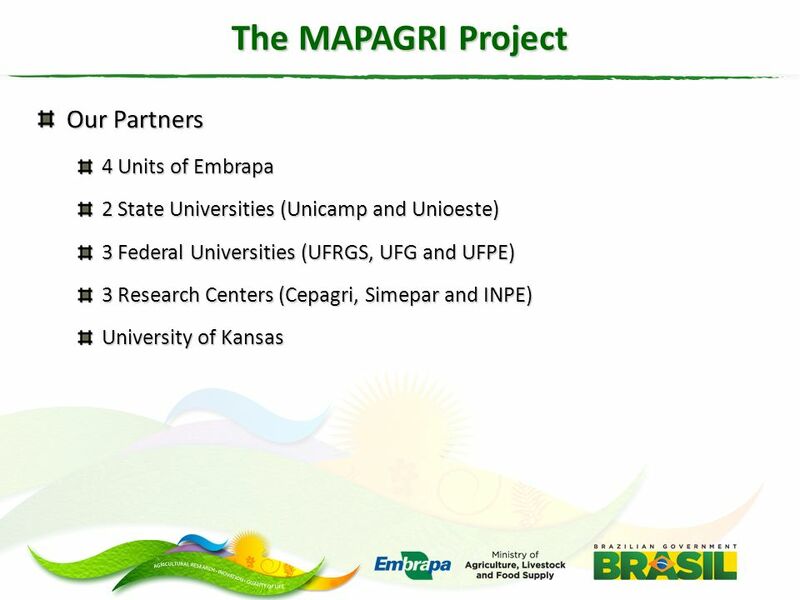 Our Mission: To provide sustainable solutions for agribusiness through research, development and innovation, to the benefit of Brazilian society. 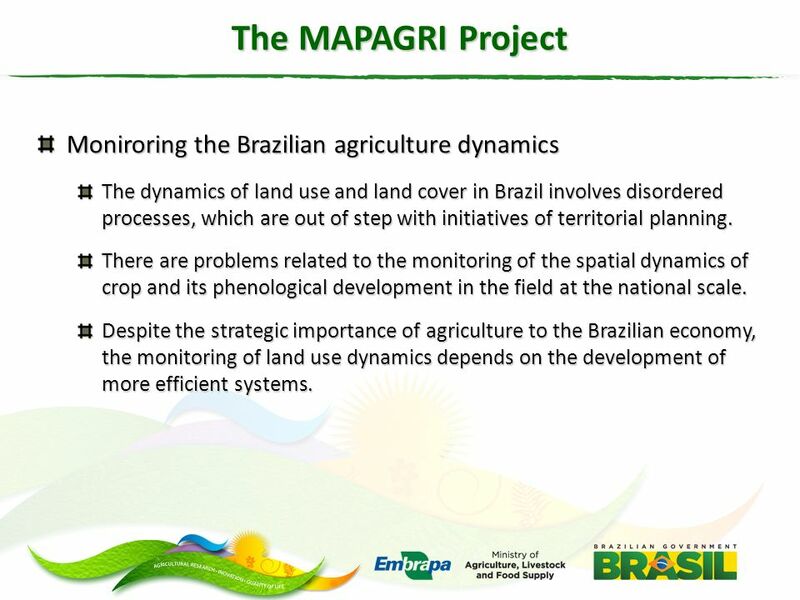 14 The MAPAGRI Project Moniroring the Brazilian agriculture dynamics The dynamics of land use and land cover in Brazil involves disordered processes, which are out of step with initiatives of territorial planning. 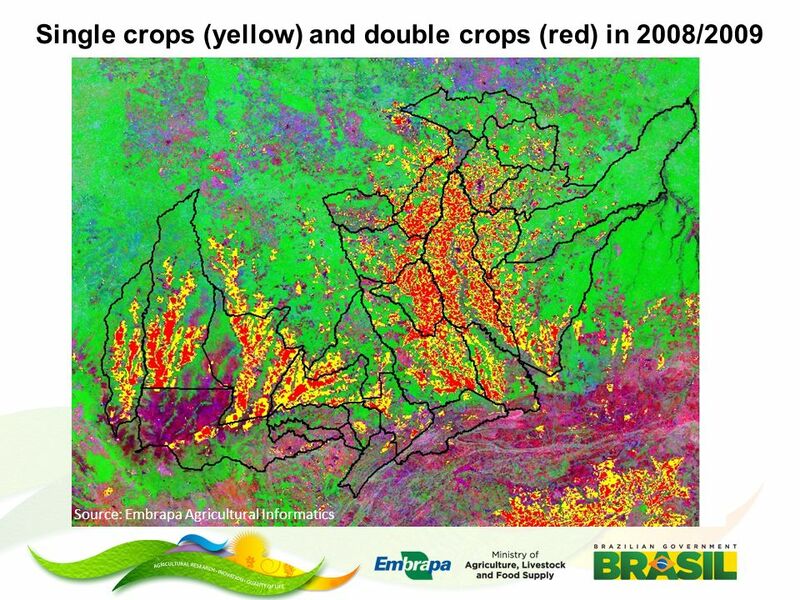 There are problems related to the monitoring of the spatial dynamics of crop and its phenological development in the field at the national scale. 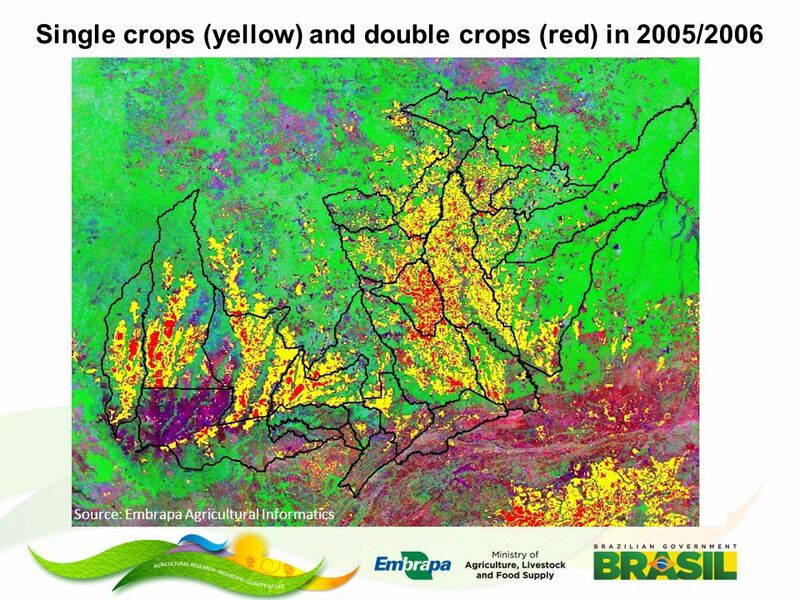 Despite the strategic importance of agriculture to the Brazilian economy, the monitoring of land use dynamics depends on the development of more efficient systems. 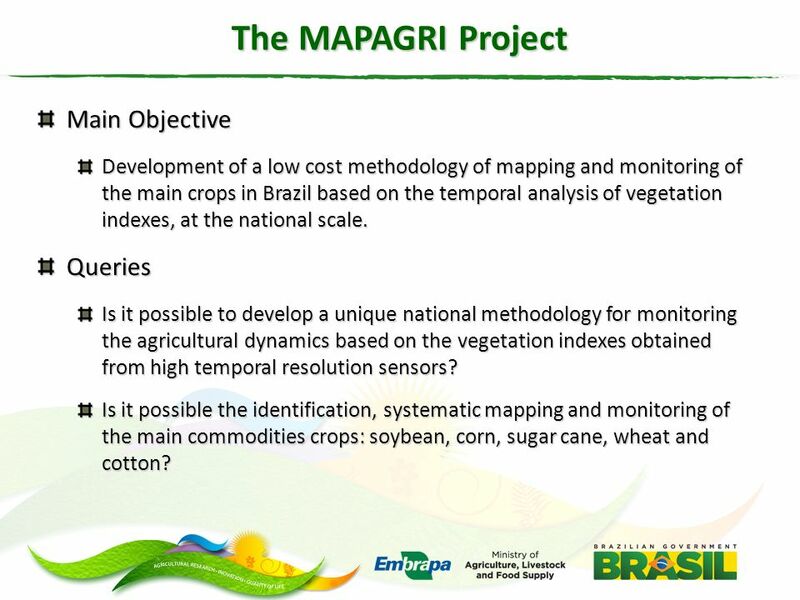 15 The MAPAGRI Project Main Objective Development of a low cost methodology of mapping and monitoring of the main crops in Brazil based on the temporal analysis of vegetation indexes, at the national scale. 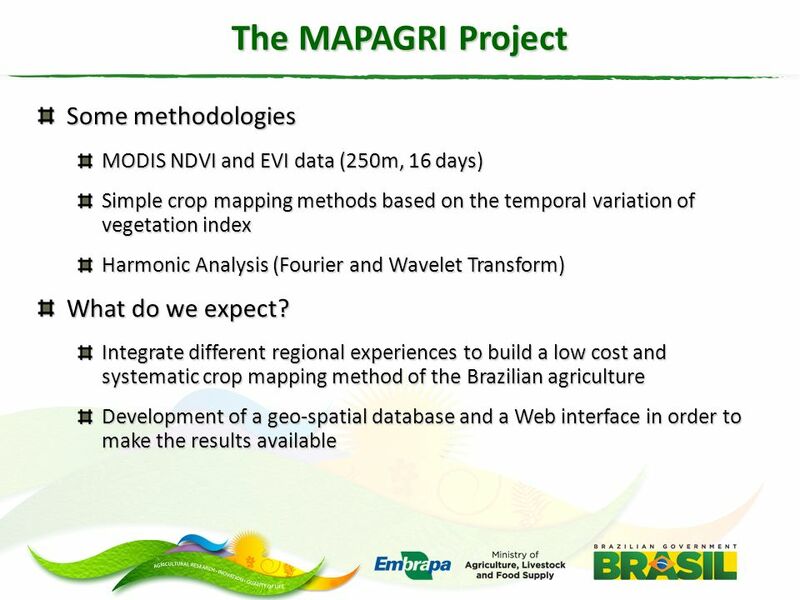 Queries Is it possible to develop a unique national methodology for monitoring the agricultural dynamics based on the vegetation indexes obtained from high temporal resolution sensors? 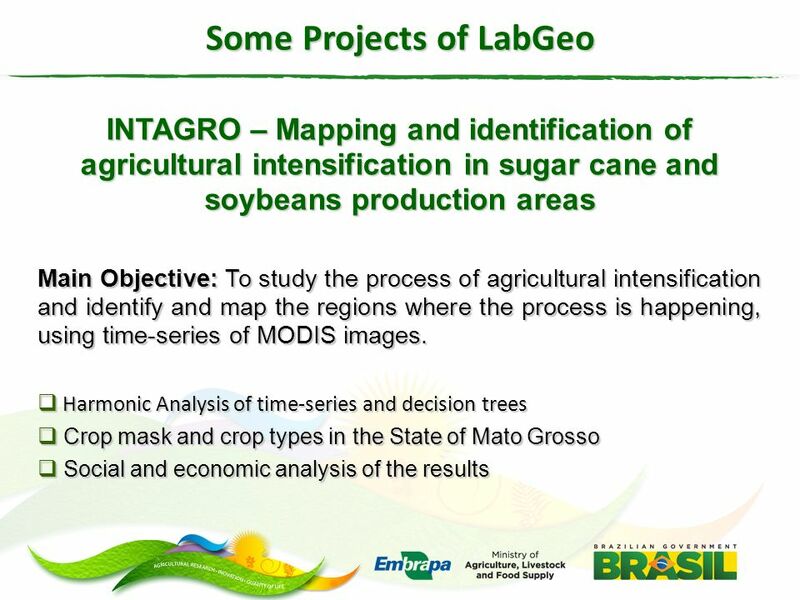 Is it possible the identification, systematic mapping and monitoring of the main commodities crops: soybean, corn, sugar cane, wheat and cotton? 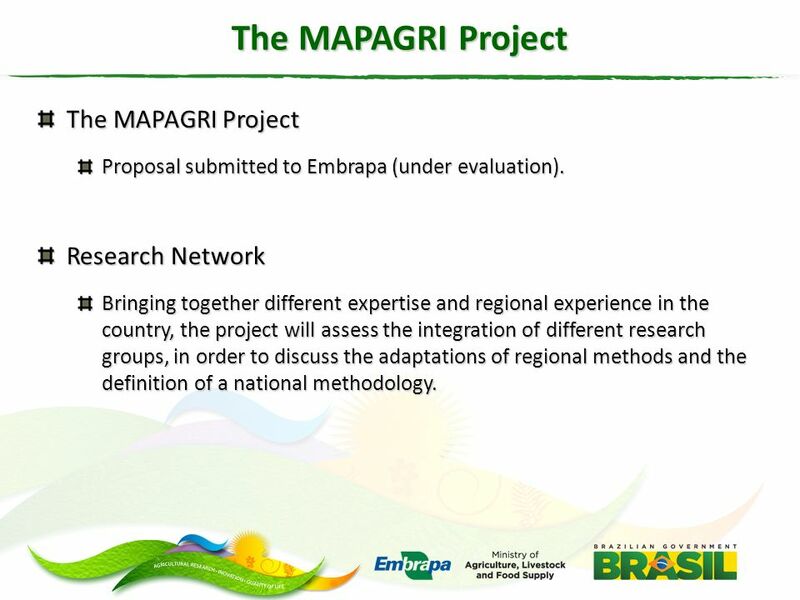 16 The MAPAGRI Project Proposal submitted to Embrapa (under evaluation). 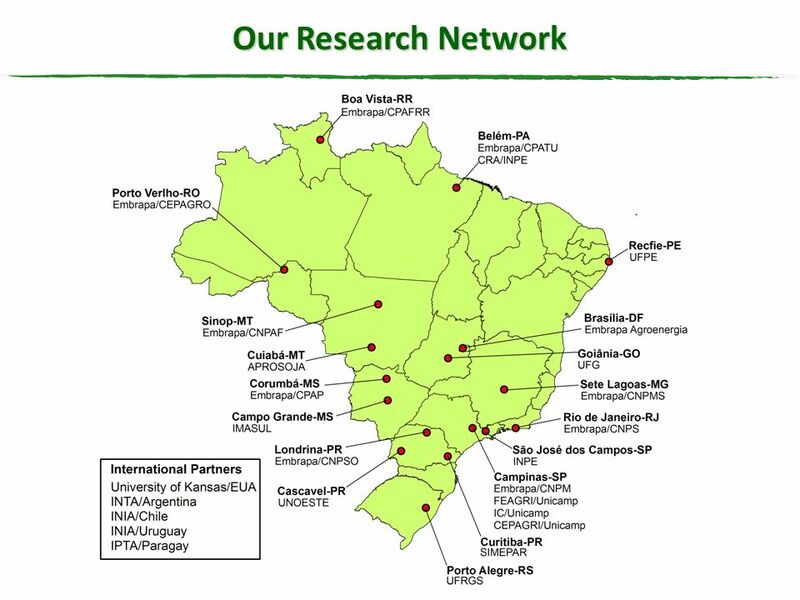 Research Network Bringing together different expertise and regional experience in the country, the project will assess the integration of different research groups, in order to discuss the adaptations of regional methods and the definition of a national methodology. 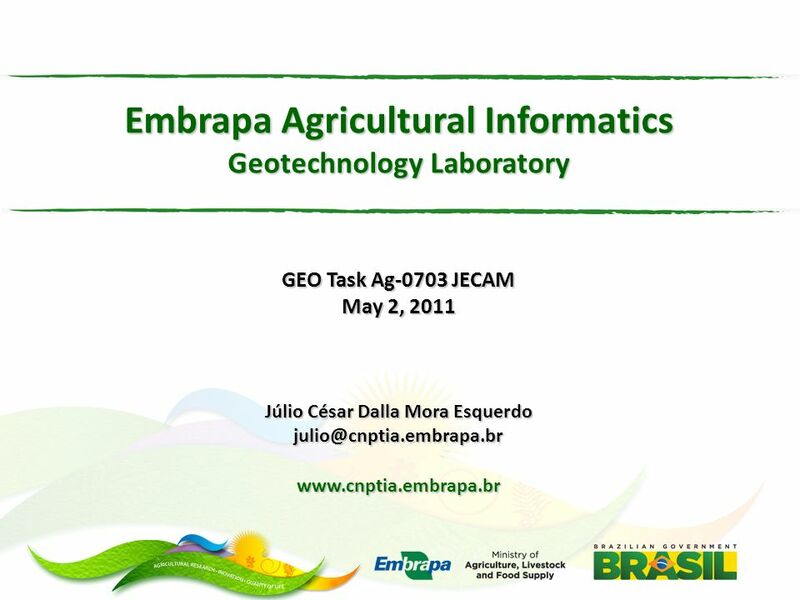 Download ppt "Embrapa Agricultural Informatics Geotechnology Laboratory GEO Task Ag-0703 JECAM May 2, 2011 Júlio César Dalla Mora Esquerdo"
Drought monitoring with coarse resolution remote sensing at the African continent level O. Rojas (FAO) and F. Rembold (JRC) One of the main water sources. INPE - National Institute for Space Research OBT - Earth Observation Coordination São José dos Campos - SP - Brazil. Decision Support and Artificial Intelligence Jack G. Zheng May 21 st 2008 MIS Chapter 4. 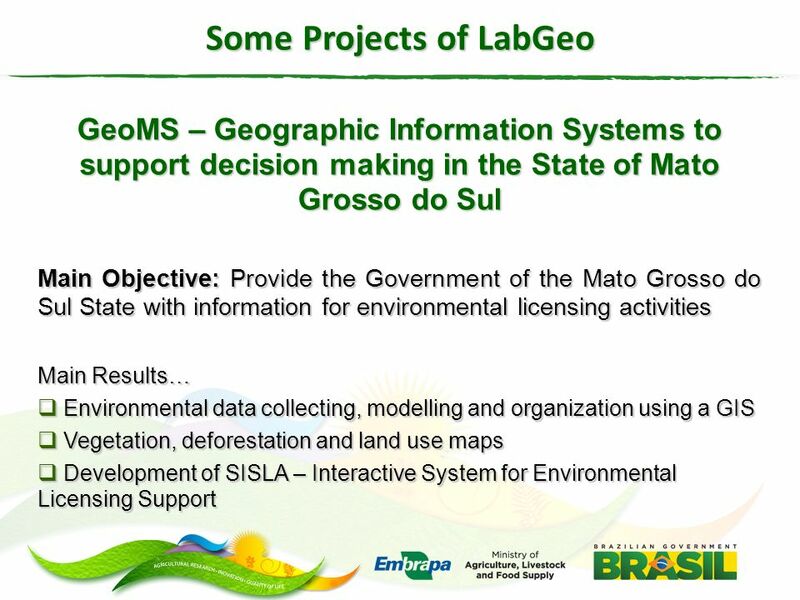 Near Real-Time Deforestation Detection for Enforcement of Forest Reserves in Mato Grosso Land Governance in Support of the MDGs: Responding to New Challenges. E-Agri Project Kick-off Meeting, Mol, 24-25, 2011 Remote Sensing of Crop Acreage and Crop Mapping in the E-Agri Project Chen Zhongxin Institute of Agricultural. Beyond Spectral and Spatial data: Exploring other domains of information GEOG3010 Remote Sensing and Image Processing Lewis RSU. 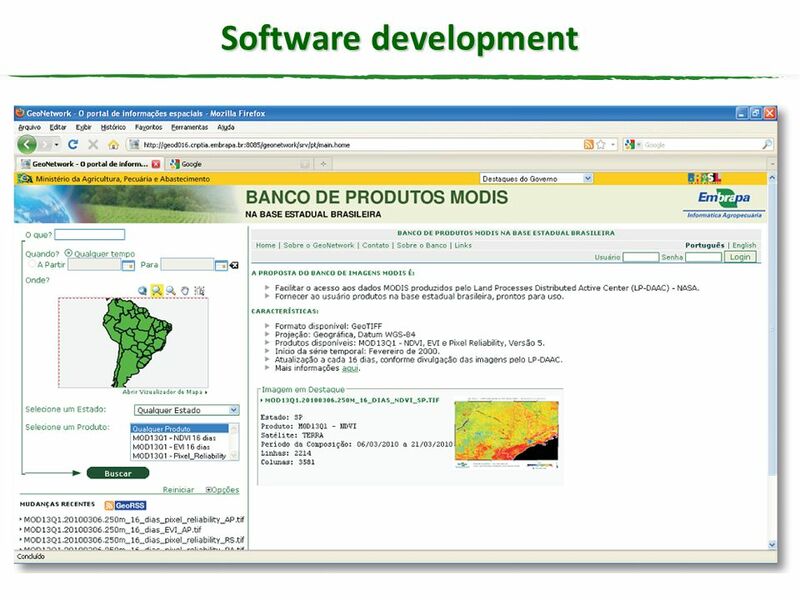 Cloud computing in spatial data processing for the Integrated Geographically Distributed Information System of Earth Remote Sensing (IGDIS ERS) Open Joint-Stock. 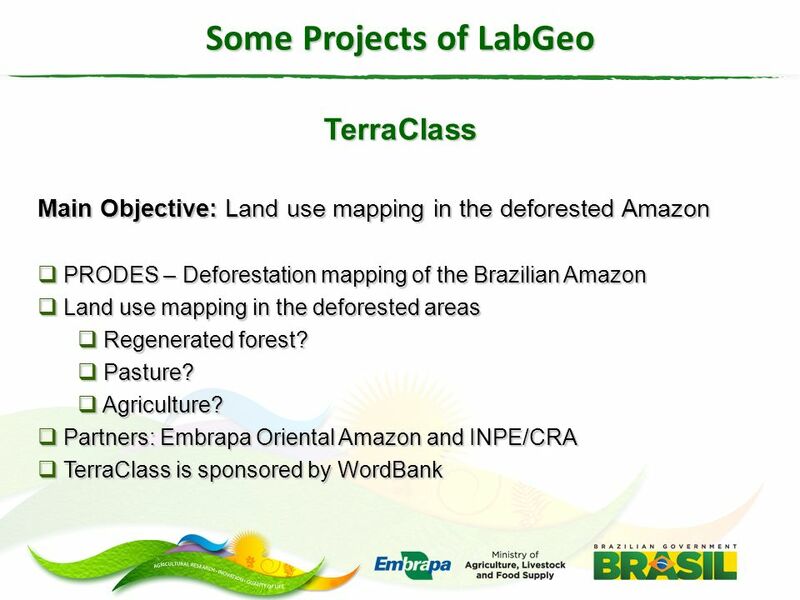 May 9, Subgroup 4: Management of forests and forest-influenced landscapes Konstantin von Teuffel and Hubert Sterba. Focal Area and Cross Cutting Strategies – Land Degradation GEF Expanded Constituency Workshop March 22 – 24, 2011 Kyiv, Ukraine. We now have a Geo-Linux. What’s next? 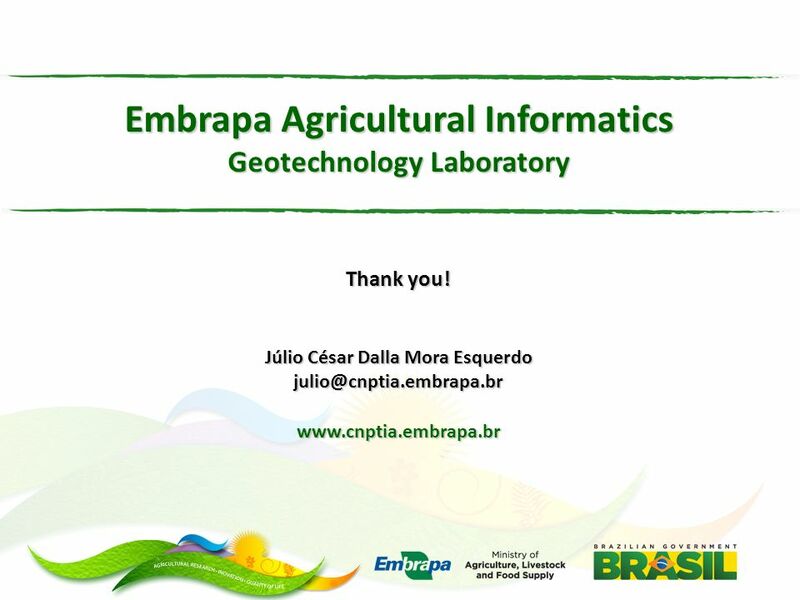 Gilberto Câmara National Institute for Space Research (INPE), Brazil Institute for Geoinformatics, University of. Xiangming Xiao Department of Botany and Microbiology, College of Arts and Sciences Center for Spatial Analysis, College of Atmospheric. Belmont Forum and FACCE-JPI International Opportunities Fund In July 2013 a joint funding Call of approximately €10·5m was launched between the Belmont. 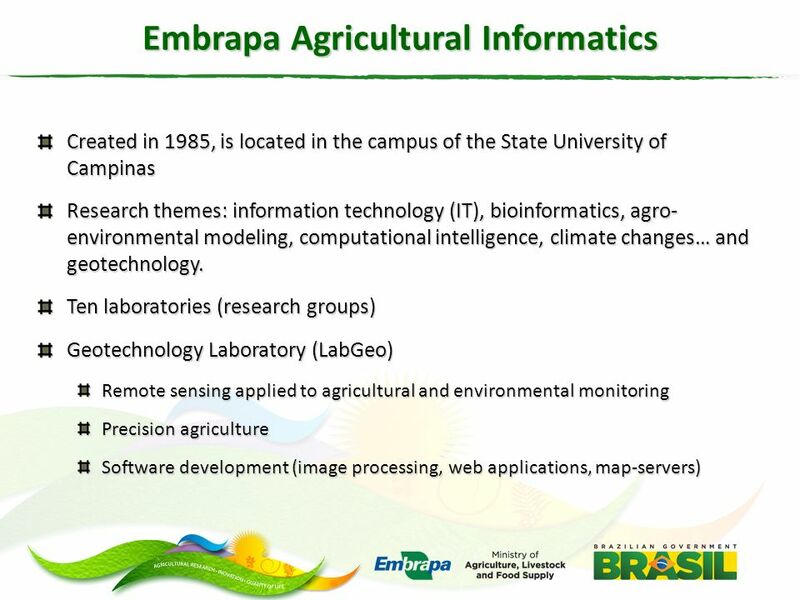 Third Lemann Dialogue – “Agricultural and Environmental Issues in Brazil” University of Illinois, 7-8 November 2013 Embrapa Strategic Intelligence System. 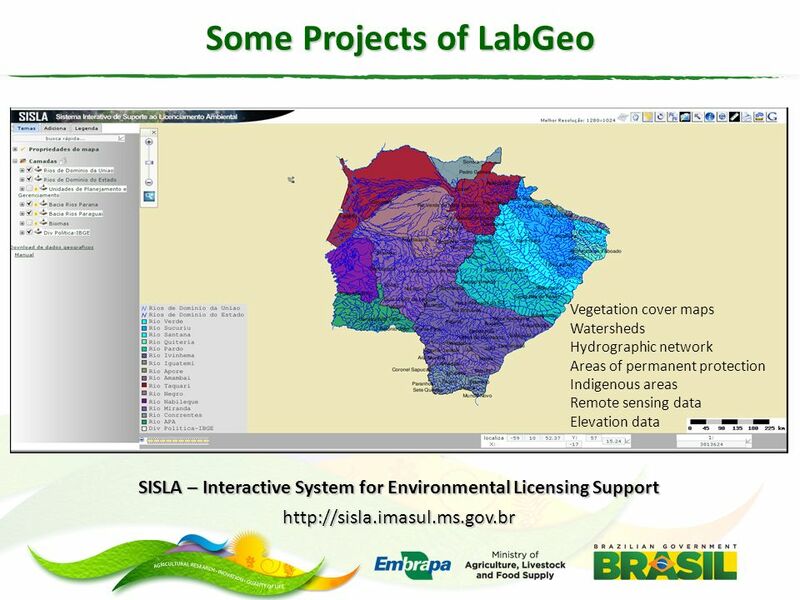 Expert Group Meeting on Tools and Modeling Approaches for Experimental Ecosystem Accounting Brazil New York, EUA, November 18 th, 2013. SDCG-4, Caltech, CA, USA 4 th -6 th September 2013 Author/Presenter MRV & Reporting Status & Related Space Data. Experience of application of modern GIS-technologies for environmental monitoring tasks Prof., Dr. Cheremisina Evgenia, Dr.Lyubimova Anna. 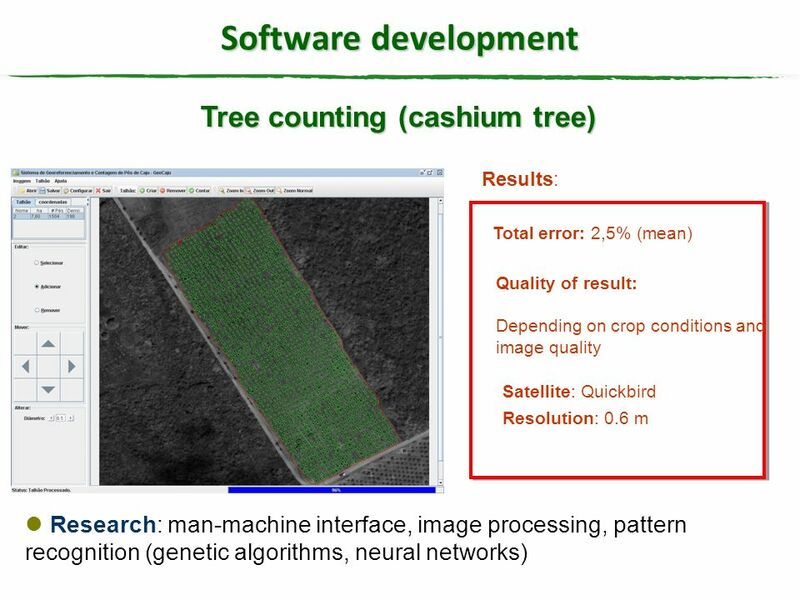 Precision Agriculture in Environmental Sustainability Rachel Crocker.